In just one decade, Esperanza Spalding has achieved so much in her musical quest and persevered even more along the way to find her own special star. Go figure that this singer/songwriter/musician who survived some challenging circumstances in her childhood would make teachers marvel, thrill audiences and teach elementary school students about the power of jazz. When the Portland, OR native first watched cellist Yo Yo Ma on the TV program Mr. Rogers Neighborhood at age four, she discovered the perfect creative outlet. Originally,she taught herself to play violin and she was so proficient at her instrument that by age fifteen, she became concertmaster in a local chamber music orchestra. But in high school, she fell in love with another instrument. From that moment on, the relationship change would prove fruitful for a long time to come. As she learned more about the dynamics of the acoustic bass, the possibilities beyond the classical music field danced in Spalding’s head. And others picked upon that love interest as well. She landed a gig with a blues band as their bass player despite a limited amount of professional experience. After refining her skills beyond just playing one bass line, she paid more dues playing hip-hop, funk and served as the lead vocalist/bassist for the alternative pop/jazz fusion group Noise for Pretend, which released two discs. The following year when she had graduated with a GED, she enrolled in a local college’s music program. There was still more refining in the works for this expressive bassist, but again the teachers grasped her potential, which eventually led to an opportunity of a lifetime – the highly regarded Berklee School of Music in Boston. The Berklee staff including vibraphonist Gary Burton demanded much from this still teenage prodigy but were astounded how she was able to deal with compositional theory despite her somewhat free spirit. After graduating at just age twenty, she was elected to the school’s faculty where she taught of all things, “Bass Lines,” a weekend camp for aspiring musicians. Spalding also had the recent pleasure in preaching the good news of jazz to an excited group of elementary school students utilizing children’s’ stories to hit her points. With plenty of side gigs under her belt including world tours with Patti Austin and playing with The Boston Pops, two friends – one of them Berklee faculty member; drummer/percussionist Francisco Mela, joined Spalding for her debut recording, Junjo. Their warm intimate tones laid down lyrical jazz with doses of Latinelegance. Spalding’s self-titled sophomore project as a leader focused more on her spunky voice which exuded calmness and excitement. With a little bit of soul, funk, pop and bop, tossed with plenty of Brazilian and Portuguese flavor, Spalding teamed with some of jazz’s top-notch musicians including Donald Harrison and New Flamingo guitarist Nino Josele. 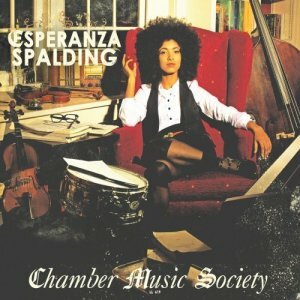 Even with an occasional misfire, Spalding’s musicality and balancing her vocals and bass playing on Chamber Music Society, considering her short tenure as a professional musician, is extremely commendable. As she continues through the musical maturation process,her fans and educators alike will grow to cherish the youthful spirit that makes Esperanza Spalding a certified jazz music star.